Finely hand-crafted oval Nantucket Lightship Oval Business Card Basket, perfect for use as an elegant holder for your executive business cards. An oval Walnut hardwood base begins this Nantucket basket and hand-tapered and beveled cane staves, meticulously hand-placed with only a whisper of space between the staves. The body of the basket is woven with Nantucket-grade cane and tightly compacted giving this Nantucket basket the ability to essentially hold water - a hallmark of my basketweaving skills. Traditional half-round rattan reed rims are scarfed and tapered, then steam-bent to a wooden form for a perfect fit to this Nantucket basket. The rims are then pre-drilled and nailed with thin brass escutcheon pins, which are then cut flush and peened over, then sanded for a smooth finish. Quality craftsmanship is seen in the small details, like the placement of the tapered staves and the additional piece of cane under the rim, giving this Nantucket basket a very refined and finished appearance. Multiple coats of varnish are applied to protect, strengthen and bring out the natural beauty of the materials. It will develop a rich dark patina over the years with use. Each Nantucket basket I personally handcraft is signed and dated on the base prior to final finishing. This final finish includes multiple coats of hand-applied varnish and clipping of any stray cane hairs which are prone to appear during the basket weaving process. These and many other fine Nantucket details set my custom-crafted Nantucket baskets apart from all others. 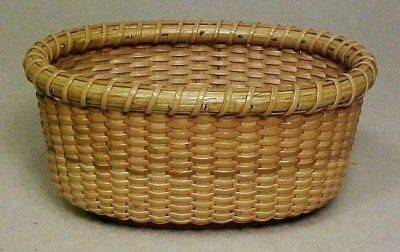 The miniature Oval Nantucket basket measures 4.75" long x 3.25" wide and is 2.25" high at the rims. Although I am no longer accepting orders for the Nantucket Oval Business Card Basket, I do craft one or two of these baskets per year. When its ready for sale, you can purchase it directly from my Simply Baskets website.